What is Flash Mortgage Kit? This is an easy-to-use Macromedia Flash application. Flash Mortgage Kit contains some very useful Flash Mortgage Calculators. Flash Mortgage Calculators let your visitors know how each payment affects their personal finance. Flash Calculators are designed to provide your visitors with graphical results and full amortization schedules. 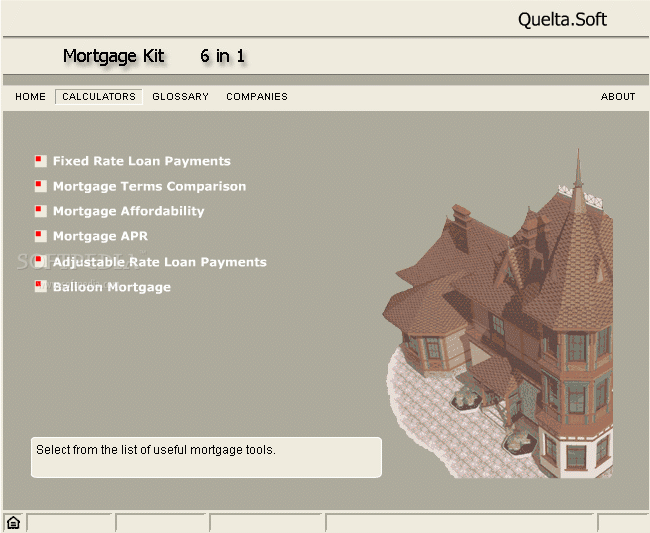 Flash Mortgage Kit sets the benchmark for mortgage calculators! Provide your visitors with graphical results and full amortization schedules. ...... Find out more in this quick article about this exciting tool. Flash Mortgage Kit is a tool that incorporates several mortgage calculators such as a fixed loan payment calculator, mortgage affordability calculator, an adjustable rate loan payments calculator and a lot more. Being a Macromedia Flash Player, you can easily put it on your website for your visitors to use it. Flash Mortgage Kit is easy to use and your visitors will know how much each payment affects their personal finance. Graphical results and full amortization schedules are provided by the flash calculators to the visitors of your website. Qweas is providing links to Flash Mortgage Kit 2.6.1 as a courtesy, and makes no representations regarding Flash Mortgage Kit or any other applications or any information related thereto. Any questions, complaints or claims regarding this application Flash Mortgage Kit 2.6.1 must be directed to the appropriate software vendor. You may click the publisher link of Flash Mortgage Kit on the top of this page to get more details about the vendor.